It’s a metaphor that has stuck with me, and one that gives me solace when it comes to some of my pet topics. Occasionally I think I make a difference, I remember being one of just two people in a meeting supporting open data, but now I think Wandsworth can claim to be one of the more open councils in the country (although most of the credit on that is down to the national policy climate). Most of the time I can only admire the tenacity of those who employ the terrier approach, and wonder what, if any, issues or causes I would have the patience to persistently champion when I return to the back-benches. So I look at Philip Beddows determined campaigning for Battersea through the Love Battersea campaign, which he started as a councillor and has continued ever since he stood down, with huge admiration. 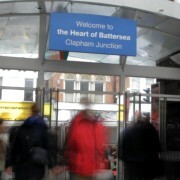 The sign greeting those leaving Clapham Junction station, Battersea. 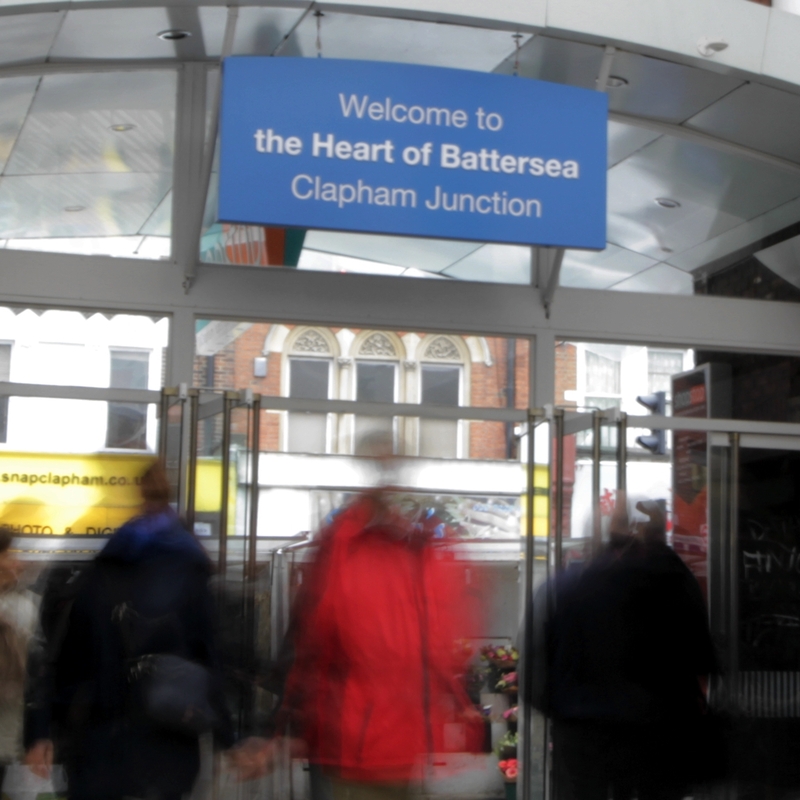 His latest triumph was unveiled this morning: a sign welcoming those leaving Clapham Junction station to the heart of Battersea. Although it was installed overnight, it was not an overnight decision, he can point to the very first time he raised the idea in February 2009. Ever since he has continued to remind, chivvy and encourage those involved to get to this stage. I can speak from experience—having been tangentially involved in the process—that the ins and outs of negotiations, legal agreements and just funding it, would have ground a lesser man down. I have no doubt that without him it would never have happened. His battle against the Claphamisation of Battersea is one that he seems to be winning. Recently it feels like the tide has turned, with people and businesses increasingly getting their location right. This, hopefully, marks a turning point, since the station is the chief culprit for people’s mistaken impression that SW11 is Clapham: there’s now a sign, in the station itself, letting people know it’s in Battersea. Battersea has a long and proud history, and a vibrant and exciting present. We should all be proud of the Battersea identity and, like Philip, do what we can to protect and champion it.